Kay Johnson is the head of Reference and Circulation Services at Athabasca University, where she has been actively involved in the development of the digital library, and consultant to the Digital Reading Room. Elaine Magusin is a Reference Services Librarian at Athabasca, and also serves as a consultant on the Digital Reading Room project. 1. Digital Libraries: A Cultural Understanding. Digital Libraries in the Matrix of Digital Culture. 2. New Dynamics for Scholarly Communication. Many-to-Many Relationships in the Digital Library. New Opportunities for Scholarly Communication. Sharing in the Online Community. Academic Culture Meets Digital Culture. 3. 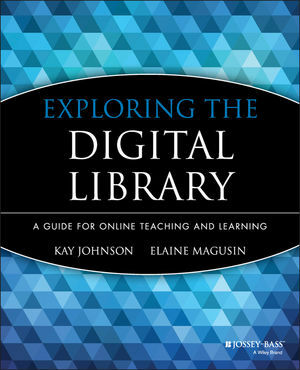 Digital Libraries in Teaching and Course Development. The Digital Library and Teaching in Distance Education. Challenges in Supporting Students at a Distance. 4. Beyond the Mechanics of Online Retrieval: Information Literacy. Integrating Information Literacy into the Curriculum. 5. Using the Digital Library in Higher Education. Using Digital Information in Higher Education. 6. Faculty-Librarian Collaboration in Online Teaching and Education. Marketing the Library and Its Services. The Importance of Organizational Climate. 7. Collaborating on Information Literacy: Case Study 1. 8. Collaborating on the DRR and Reusing Learning Resources: Case Study 2. Beyond Course Reserves: Reusable Digital Resources. 9. Beyond Digital Library Culture Barriers.